The Hampton Inn - Suites Roseville California hotel is ideally located near the business corridor on Douglas Boulevard near outstanding shopping venues and exciting local attractions. Our Roseville California hotel offers all of the latest amenities and signature service to make you feel right at home. The Hampton Inn - Suites Roseville California hotel features 85 rooms and suites all non-smoking nearly 1300 square feet of meeting rooms space Hampton Inn - Suites signature Cloud 9 comfortable mattress and soft sheets with your choice of feather or foam pillows and plush down-like blanket and duvet cover. Also all the guest rooms feature coffee maker iron and ironing board here at the Hampton Inn - Suites Roseville California hotel. In addition the Hampton Inn - Suites Roseville California hotel offers complimentary On the House hot breakfast daily and On the Run Breakfast Bags Monday through Friday complimentary high-speed internet access in all guest rooms and wireless high-speed internet access in the lobby and the meeting rooms. Also complimentary local calls complimentary copy of USA Today newspaper in the lobby Monday through Friday complimentary business center and complimentary in-room movie channel. The Hampton Inn - Suites Roseville offers a Suite Shop available 24-hours a day coffee and tea service is available 24-hours a day in the lobby as well as front desk messaging and fax services is available 24-hours a day. 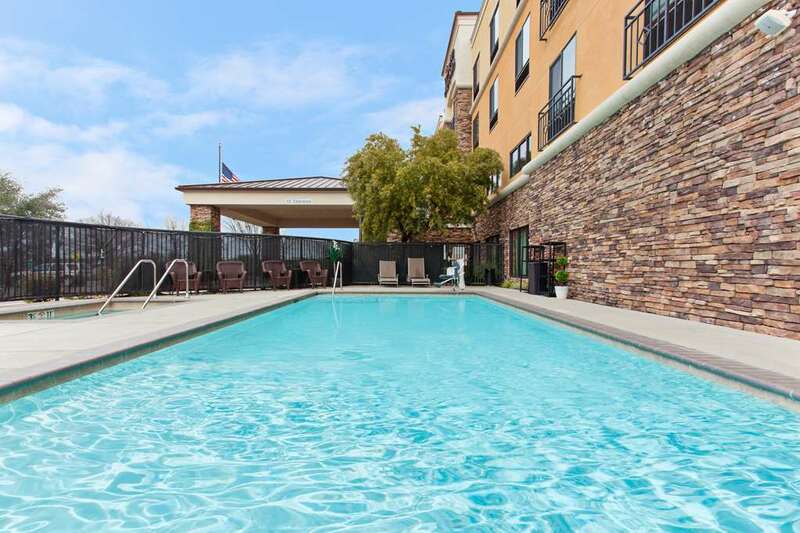 The Hampton Inn - Suites Roseville California hotel features an outdoor heated swimming pool and hot tub. Also earn Hilton HHonors Points - Miles for the same stay. All stays are backed by our 100 satisfaction guarantee. If you*re not satisfied we don*t expect you to pay. That*s 100 Hampton. We love having you at the Hampton Inn - Suites Roseville California hotel.